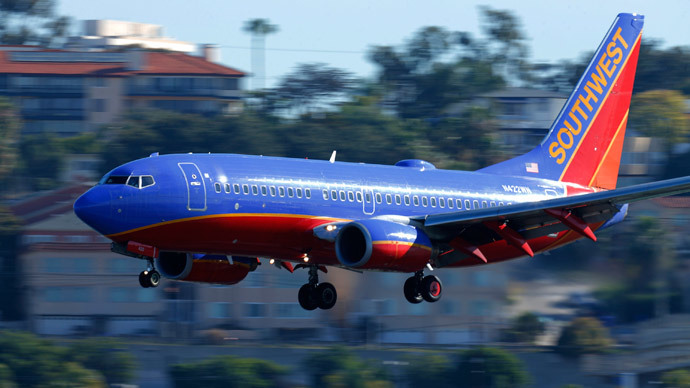 The Federal Aviation Administration (FAA) is investigation an incident where a drone was seen flying very close to a Southwest Airlines passenger jet on Friday Afternoon. The Federal Aviation Administration (FAA) is investigating an incident in which a drone was seen flying very close to a Southwest Airlines passenger jet as it came in to land in Texas. Southwest flight 28 was about a mile from Dallas Love Field Airport on its flight from Houston to Dallas when a quadcopter drone was seen near the left wing of the Boeing 737, the local NBC affiliate reported. “It was close enough to Love Field that the air traffic controller was able to see it from the tower,” FAA spokesman Lynn Lunsford told the Dallas Morning News. He added that the plane didn’t need to take evasive action. Dallas police confirm that the drone was spotted at 1:55 p.m. local time. According to the FAA, air traffic controllers could see the drone from their control tower. In addition to ground units, the Dallas police dispatched Air One, its police helicopter force, to help look for the drone, but it were unsuccessful in its search. The plane landed at Love Field Airport just before 2 p.m. Earlier in 2015, the FAA drafted regulations that would ban the use of civilian drones that aren’t within the direct vision of their human operator. This restriction would also apply to Amazon, the tech giant with ambitions to have autonomous drones fly packages straight to the doorsteps of customers. The so-called ‘Commercial UAV Modernization Act,’ proposed by Senator Cory Booker (D-NJ) in March, would loosen restrictions on commercial usage. The bill would allow companies to operate small, unmanned drones for various commercial purposes, such as mapping crops and surveying construction sites.